Don’t miss the release of Entangled Crush’s first book, Aimee and the Heartthrob by Ophelia London! 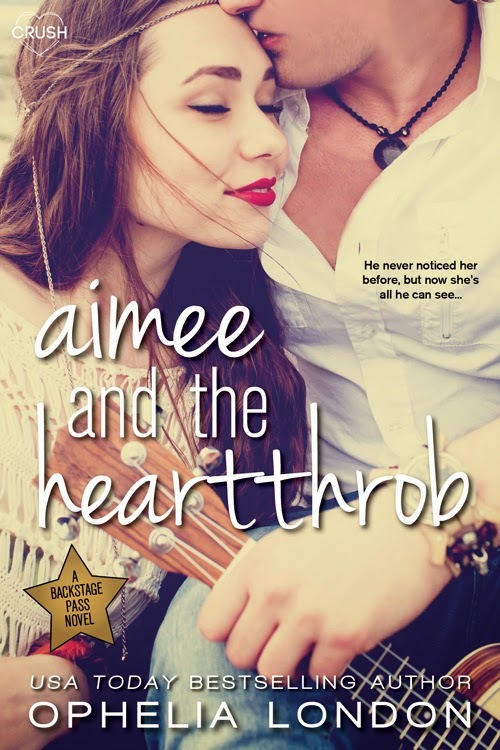 Aimee and the Hearthrob killed me with it’s adorableness. I loved the book and flew through the pages. First off the whole series is such a great idea. It revolves around a boy band and each book focuses on a different boy and, here is the cool part, written by a different author. So Ophelia London tackled the Heartthrob Miles in this first installment of the Backstage Pass series. For me reading Ophelia London is a no brainer, I love her romance storytelling and her way of creating chemistry between characters. She also likes the slow burn. Aimee is pretty adorkable. She has her own Vlog, where she and her best friend review books, movies and music. Although she hasn’t reviewed Seconds to Juliet because of her falling out with the lead singer. I really liked how Aimee stuck her ground in the beginning, Miles broke her heart and she wasn’t going to cave. Totally blowing him off when he first comes in contact with her. She’s also pretty honest about her feelings and even though she’s been hurt before tries to put it all out there. Miles of course is the Heartthrob of the band for good reason. I liked how he was this cool singer but also kind of stumbled around his relationship with Aimee. He would do super adorable things for her but also could get easily flustered where it concerns her. The plot is great because it’s just what I needed. The skeletons in the closet are not so bad and a lot of the book is Aimee and Miles falling in love. I just loved their little adventures they went off onto and easily found myself smiling. When the crap hits the fan it’s not great but it’s not the worst. It was nice to have something a little lighter be the conflict. I really loved the book, it was such a great pick me up. I loved the romance and the way Aimee and Miles finally find their way to one another. Plus he writes songs. Come on. He can write me a song any day.